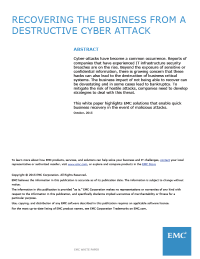 This white paper highlights EMC solutions that enable quick business recovery in the event of malicious attacks. The financial impacts of not being able to recover from a cyber attack can be devastating and in some cases lead to bankruptcy. To mitigate the risk of hostile attacks, companies need to develop strategies to deal with this threat.